• Factory Sealed, no external seals required. 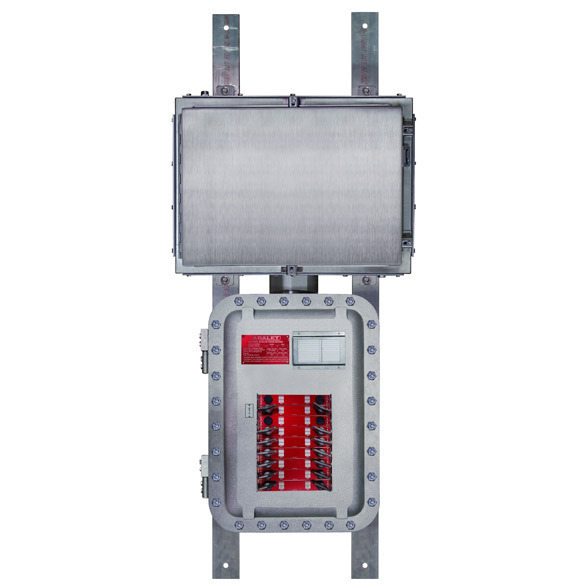 • Fully Wired from Panelboard Enclosure to Terminal Enclosure. • External Operating Handles can be padlocked either in the “ON” or “OFF” positions. • Spring-loaded Operator Handles allow cover to close with handles in any position. • Copper Bus is standard. • Isolated Neutral and Ground Bar provided. • Type 4 Gasketing provided for water and dust-tight seal. • Breather and Drain provided for each enclosure. • Removable Gland Plates for field installation of conduit entries. liquids from dripping into the enclosure when the door is open. • Terminal Enclosure has continuously welded seams ground to a smooth finish. • Ample wire bending space allows for easy terminal connection.